This uniquely designed leather recliner is sure to have a place in your home. It boasts a distinct Leo Ash colored leather that exudes personality, while also matching well with the simple but finely crafted wood arms, base, and legs. Furthermore, the reclining mechanism is easy to use, allowing you to lounge through your days and nights. 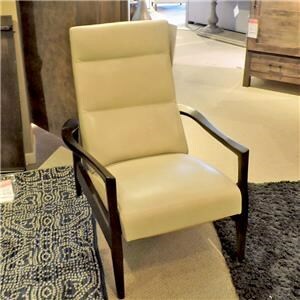 The 1617 Leo Ash Leather Recliner with Wood Legs by BeModern at Belfort Furniture in the Washington DC, Northern Virginia, Maryland and Fairfax VA area. Product availability may vary. Contact us for the most current availability on this product.